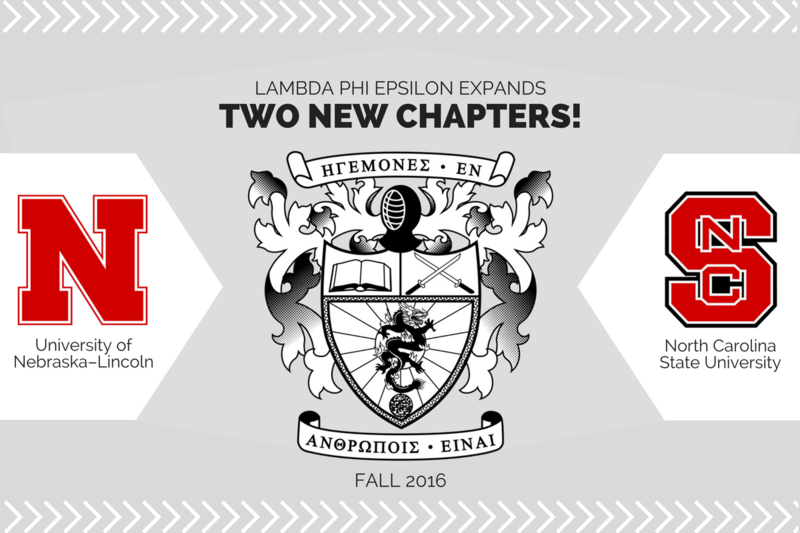 Make Way for UNL & NCSU - Lambda Phi Epsilon International Fraternity, Inc. The International Board of Lambda Phi Epsilon is pleased to announce the successful chartering of two new chapters this fall. “We on the Expansion Team are very excited to welcome these two new chapters to our ever growing roster. We hope to continue our current expansion schedule at institutions that demonstrate the demographic and cultural capacity to sustain fully operational chapters in the coming years,” says Andrew Chen, Director of Expansion. On November 6th, the International Fraternity established its 61st chapter at the University of Nebraska at Lincoln, located in the Midwest Region. Alumni from the University of Kansas facilitated the expansion process. “Being a mentor to the UNL charter class this past year has been an honor, extremely rewarding, and self-reflecting. Self improvement as a leader never stops. As a Lambda men, we must continue to grow ourselves, build our foundation and invest in our future,” says New Member Educator Hoang Nguyen (Spring 2003). The Southeast Region welcomed the 62nd chapter of Lambda Phi Epsilon at North Carolina State University (NCSU), established on November 18th. New Member Educators Tim Wu (Fall 2013) and Henry Lieu (Fall 2014) from the University of North Carolina at Chapel Hill oversaw the implementation of the Noble Brother intake process. “The decision to choose Lambda Phi Epsilon was made in the summer of 2015 as we recognized that Lambda Phi Epsilon offers an extensive amount of resources with over 10,000 brothers. I want to provide an opportunity for men who seek self-improvement without compensating authenticity. As I embark on an active journey as a new chapter, I seek to provide a sense of identity for Asian Americans on campus,” says Justin Lo, president of the NCSU Chapter. The University of Nebraska–Lincoln is a public research university located in Lincoln, Nebraska. It is the state’s oldest university, and the largest in the University of Nebraska system. Learn more at www.unl.edu/. North Carolina State University is a public research university located in Raleigh, North Carolina, United States. It is part of the University of North Carolina system and is a land, sea, and space grant institution. Learn more at www.ncsu.edu/. The road to 100! Let’s get it expansion team!